Hello and welcome to the website of Duncan Frewen. 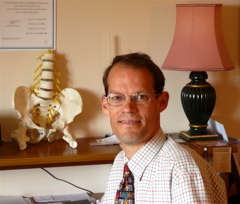 I am a Chiropractor and Homeopath practising from clinics in Hastings and Northiam. My practices serve Hastings, Bexhill, Hawkhurst, Cranbrook, Northiam, Tenterden and the surrounding areas of East Sussex and Kent. Chiropractic and homeopathic treatments are gentle, safe and effective because they acknowledge the fact that your body has great potential to heal itself, both emotionally and physically. I am passionate about helping people overcome their conditions and as I have suffered problems in the past I can therefore understand the distress your condition is giving you. Since my teens I have found chiropractic and homeopathy to be more effective than conventional medicine for my own health. My goal is to work with you to achieve a better state of health. To find out more about homeopathy click here and/or about chiropractic click here. To make an appointment, or to get in touch click here.